Americans are obsessed with having the biggest and “best” things. But, when we don’t actually need anything, this desire can simply be a drain on our resources, mental energy and time. A method which many people are attempting to use to break out of this funk is a minimalist lifestyle. However, some are taking this concept to an extreme and not just reducing the amount of stuff they have, but also downsizing their homes. Welcome to the tiny house movement! This concept is taking hold amongst many people across America. This movement focuses not only on downsizing but also on saving money, reducing debt and living a simpler, more carefree lifestyle. What’s not to love? Of course, it’s not all blue skies. There are many downsides to this lifestyle choice and many concerns which need to be considered before it’s adopted. But, for this article, let’s enjoy the positives first. Keep reading to find out some of the benefits of tiny house living and how you can upgrade your life by downsizing. 3 3. You’re Helping to Save the Environment! There is a whole community of people who are taking up this lifestyle. And, when multiple creative minds are working on a project, it’s more likely to be solved! Some people choose to build a tiny house with items they’ve found. Meanwhile, others prefer to go for a more bespoke tiny house which caters to their needs and is small but luxurious. When choosing which tiny house is right for you, it’s worth firstly going over your finances and budgeting accordingly. 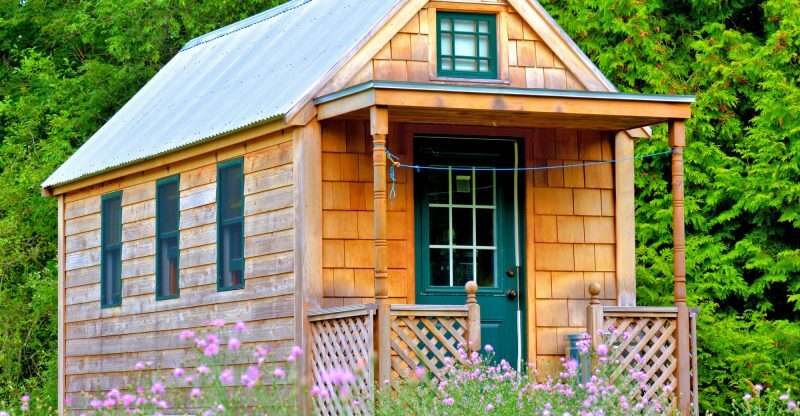 By choosing to live in a tiny house, you could be saving yourself a lot of money. But, you need to be smart about this process. Costs can run from just $10,000 to over $150,000. But, it’s worth asking yourself before you make a big purchase – is this the best use of my money? Your suitcases don’t need to be packed, boxes can be left unfilled, and you can simply put your whole house on the road. Some people opt to have their tiny homes built on wheels so that it’s straightforward to drive off with them to a new location. Of course, if you’ve bought a patch of land to park your tiny house on then this process is a little more difficult as you’ll need to sell it. But, as soon as you have, you can be on your way. No removal van needed! 3. You’re Helping to Save the Environment! You can laugh in the face of all those people thinking they’re environmentally friendly by simply avoiding plastic water bottles while still wasting electricity and heat in their unnecessarily huge homes. Well, not really unless you’re pretty mean. But, with tiny house living, you’re doing a lot of good for the planet. They use less material to build. They use a lot less energy (which is the biggest problem with large houses). Less fridge space means less buying of food which will just be forgotten and thrown away. Fewer possessions in general – by buying less, we cause less damage to the planet. Solar panels are often a fixture of many tiny houses and offer renewable energy. Right now, an average American consumes double what they would have fifty years ago! Extreme minimalism isn’t for everyone. Not all of us want to throw away every piece of clothing we own and sleep on a floor mat. But, if you choose to live in a tiny house, downsizing and adopting some of those positive minimalist qualities becomes a lot easier. If you can curb your consumption, you’ll not only be happier; you’ll also be helping to save the environment. Why would you buy a lot of stuff when you have a tiny house? There’s nowhere to fit that new jumper which looks just like your old one anyway. Get frugal and thrifty and start repairing old clothes, rather than throwing them away to save money and space! This one is a no-brainer for those of us who hate cleaning and tidying. Tiny house living suddenly becomes the best option ever. When it’s time to clean up, all you need to do is a quick ten minutes, and the place will be spotless once more. With tiny house living, tidying is also very easy. The idea behind the concept is that everything has a place, and everything should be in its place. Having less stuff never looked this enticing, did it? This one is for those young people who are entirely lumbered in debt and maybe still living with their parents. It can be incredibly demoralizing to save up for a downpayment for a house. All the while seeing your bank balance dwindle every month. This is all thanks to rent, bills and that pesky need to eat. But, with the downpayment of a regular home, you could invest in a tiny house instead. Of course, there’s still the worry of where to park your home. But, the price of a tiny house is a lot less than a regular house overall. Once you’ve paid the initial cost of the house, you can then focus on saving all the money that was going towards expensive rent. Of course, this doesn’t solve everyone’s problems. But, it’s a new and exciting option to consider if you’re wondering if you’ll ever be able to afford a house. 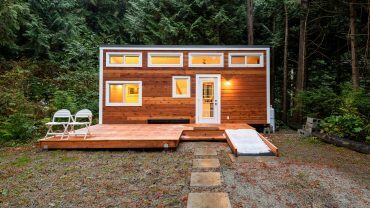 By leaving the city and building a tiny house, you can actually work on reducing your debt. After the initial cost of building your tiny house, you’ll have fewer energy bills to pay and less to upkeep. But, one of the best aspects about tiny house living is that you can live without a mortgage! Of course, this totally depends on your financial situation. Your initial cost could easily push you into debt if you’re not clever about the build. You need to choose early on whether you can go the DIY route (maybe with the help of a few Workaway helpers). Or, will you need to buy a kit? The more expensive option is having someone build the house for you. But, it’s still a lot less costly than a traditional home and can definitely be done without a back-breaking mortgage. Getting creative is a great way to feel less stressed, more accomplished and is wonderful for your overall wellbeing. When you’re focused on making as much money as possible to try and pay off your mortgage and debt, you have little time to be creative. Worse still is that, on the weekend, you suddenly have 101 jobs you need to complete around the house. However, when you downsize to a smaller house, one of the biggest benefits is the fact that repairs take a lot less time! If you learn how to fix your own home, tiny house living also becomes a lot cheaper. No need to call the handyman over when you can do it yourself. Then, after an hour of fixing up your home to be good as new, you can get back to what it is you enjoy. Maybe you’re learning a new language or instrument? Maybe you’re writing a book about your tiny house experience. Having more time for creativity will definitely help you grow as a person. Who doesn’t want that? Saying goodbye to your kids and sailing into retirement with a large house to maintain is rough. Downsizing can help you reshuffle and reorganize your life, so that emptiness you feel in the house decreases a little. If you want to go on holiday more, save on costs and get rid of all your kid’s old stuff, a tiny house is a great option. For the first time in 18+ years, you can choose how everything looks. No more choices based on what colors, furniture, and decor are best for the kids. That is, depending on where your tiny house is parked, of course. But, if you’re subletting some land from a friend, you may want to consider offering to help them out for reduced rent. If you’ve bought your own plot, your tiny house will take up a lot less space than those HUGE houses you see people building nowadays. Tiny house living will help you bring the outside in with you. By having less space in your home for packaged goods, you’ll be more likely to eat healthy fresh food instead. But, why not try growing plants and even food in the window boxes of your tiny home? Pick lavender to help you sleep, and you’ll simply need one plant to make your whole home smell great. Basil and coriander are great to grow inside and can make your veggies taste delicious! If you’ve bought land to park on, then why not start planting and growing your food in your backyard? With your resulting yield, you’ll be able to enjoy coming up with new healthy recipes to enjoy. By growing your food – you’ll also save money. Win, win! Do you quickly get very bored with how your home looks? With the disposable income which your tiny house lets you save, you’ll be able to change it up regularly. Better yet, as your house is small, you can easily paint the outside with one tin of pain (maybe an exaggeration!) And, you can very easily redecorate the inside. Buy yourself some new furniture and give your old pieces to someone who’s just starting their tiny house adventure. There’s a huge community out there. At house parties, there’s nothing more annoying than being stuck with Greg from the office who only talks about his love of horror movies. But, you can also make sure everyone is having a great time by simply glancing around the room. You’ll be in earshot to overhear any boring conversations and quickly break them up! Your friends will thank you. This also means fewer one to one chats, but more intimate group conversations around your small table. Everyone has to mingle as there’s no space not to! If you’re moving in with a partner, there’s no better way to get “coze-ed” up. Are you moving in alone? Great! Your home is the perfect place for you to relax and listen to the rain after a long, hard day. Cozy up with a cup of tea which you can make from your couch. Turn on your heater, and within minutes your house will be warm. If you’re saving money, huddle up under a few blankets and watch a new series. What’s not to love? It’s easy to gloss over what it’s really like having a tiny home, of course. There are many downsides which need to be considered before you make the leap. These include: Where will you park your tiny house? Is the land affordable? Will you have to pay to install a septic tank? Hopefully, by reading over these benefits, you’ll feel sure that, if you love the idea of tiny house living, you can overcome the trials you may face! Have you built your own tiny house? Get in touch with us to tell us about your experience.